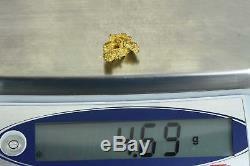 Australian Natural Gold Nugget Weighs 4.69 Grams. Australian nugget are very high in purity running from 94-98% pure. All Nuggets are Pictured or Partially Pictured with a U. S Quarter which is 24.5MM in diameter to give you an idea of Size Proportion. Each nugget comes with a certificate of authenticity guaranteeing it to be genuine. That would include rivers, streams, ancient dried up river channels and underground riverbeds. Gold nuggets range from 65 to 95 fine 16-23KT gold and can have other mineral content such as silver and copper mixed in with it. What s Exported By ExportYourStore. 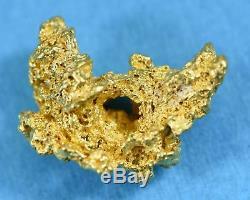 The item "#982 Australian Natural Gold Nugget 4.69 Grams Genuine" is in sale since Sunday, June 24, 2018. This item is in the category "Coins & Paper Money\Bullion\Gold\Nuggets".